Consider your child(ren)'s age and disposition. Are they old enough to help take care of the animal and play with it carefully? If you have light sleepers, avoid animals that are most active at night. You'll want to take into account how much room you have for a cage. The life span of a rodent is between two to seven years, depending on the species. The cages require weekly cleaning. Although hamsters are one of the most common pocket pets, they are actually not a great choice, as they tend to nip and are nocturnal. Rats, despite their poor reputation, make good pets. They require lots of attention and affection and are most active at dusk and dawn. 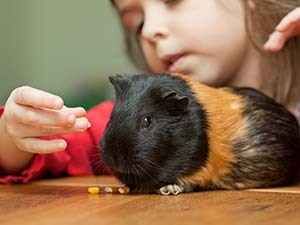 Guinea pigs love to snuggle and are less active than rats. They need fresh veggies and a larger cage but don't require as much hands-on time. Gerbils don't require as much cage space and are very active in their habitat. They are better for kids over 5 because of the risk of salmonella. Overall pocket pets are not a great choice for younger kids, who may be too enthusiastic and handle them too roughly.